I have been discovering a lot of amazing products lately, so I’ve decided to share them with all of you, and I hope that you will share your favorite products with me. This first one is a dressing. I bought it to satisfy a recipe I was going to make, and also as motivation to eat more salad. Well, it never made it into whatever recipe I was going to make with it, because I DUMPED it all over my veggies & salads, day after day, until it was all gone. If you like hummus, you will probably like this dressing. It has tahini, lemon juice, oil, and garlic as common ingredients. I do notice the vinegar taste, so if you are not a fan, you may not enjoy it, but my husband doesn’t like vinegar, and he thought it was pretty great, too. Plus, the goddess on the bottle and I have almost the same hair! It’s vegan, organic, and has no artificial colors or preservatives. It does contain soy and wheat & has a fair amount of fat. What are your favorite salad dressings? *Even if you aren’t vegan, many products can be ‘veganized’, so please share! 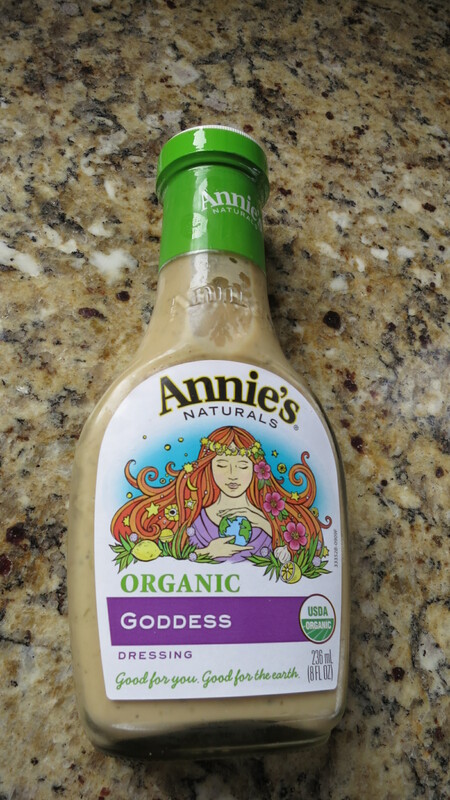 This entry was posted in Food and tagged annie's goddess, hummus, organic, salad dressing, tahini. Bookmark the permalink.